As a fan of The Garden on Sunset, it was a joy to join again in the endearing story of the three Hollywood ascendants: Marcus, Kathryn, and Gwendolyn. Through an adept combination of skillful character development and evocative settings, Martin Turnbull has, in the second novel in a promised series, become even more of a solid and resonant storyteller. In The Trouble with Scarlett, Turnbull’s characters have become (as real people do over time) more stable and clearly defined, and what might have deteriorated to an expected “gimmick” of involving his fictional characters with real people in historic events has instead become even more seamless, what might have been a clumsy technical contrivance is now an organic and properly rhythmic narrative voice. Even when real people and events are portrayed, rather than retelling the same old warhorse tales that have been seen and heard a million times, Turnbull has chosen his supporting cast and settings wisely, in order to enhance and focus his narrative and deepen the reader’s understanding of and affection for his characters. Rather than this calling attention to artifice, his deftness creates situations and events that ring absolutely true, and that range from the hilarious to the heartbreaking–sometimes in the same paragraph. In The Trouble with Scarlett and its predecessor, The Garden on Sunset, Turnbull has created a gentle, deeply-felt, and intelligent construct for telling relatable human stories with endearing characters in a delicious and fascinating setting. These novels will delight movie buffs with their erudite references and meticulously accurate people and places; and educate neophytes (the right ones, anyway) to seek out the films, personalities, and historic events and places that are portrayed. After reading Martin Turnbull’s first book in his ‘Garden of Allah’ series, I was anxious to read ‘The Trouble With Scarlett’. Reuniting with Marcus, Kathryn and Gwendolyn was like meeting old friends again. What an entertaining group they are as they hobnob with Hollywood’s most famous folks. This second book has as its backdrop that exciting time when Hollywood was in the throes of casting Scarlett O’Hara. Of course, Gwendolyn thought that the part was made for her–Selznick thought otherwise despite Gwennie’s outrageous attempts at getting his attention. Then we have Marcus who made the ultimate faux pas in front of William Randolph Hearst, while Kathryn took on gossip queen Louella Parsons. Never a dull moment. Looking forward to book three! Did I hear someone mention Citizen Kane?? Summer, 1936: The country is crazy for “Gone with the Wind,” but Hollywood knows Civil War pictures don’t make a dime. Then David O. Selznick snaps up the movie rights and all the chitchat in town is asking one question: Who will win the role of Scarlett O’Hara? Cocoanut Grove cigarette slinger Gwendolyn Brick is determined to be the silver screen’s Scarlett—but so is every other pretty gal with a deep-fried accent. She’s going to have to stand out bigger than a hoop skirt at a Twelve Oaks barbeque. Nobody in Hollywood dares outscoop Louella Parsons until Kathryn Massey comes along. Her boss at the Hollywood Reporter leaves her hanging, but the telephone rings and it’s Louis B. Mayer’s personal secretary, Ida Koverman, with a proposition. 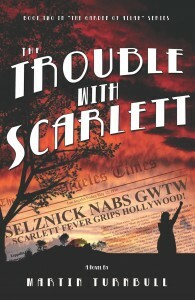 “The Trouble with Scarlett” is the second in Martin Turnbull’s series of historical novels set during Hollywood’s golden age. Martin Turnbull is a co-founder of the Alla Nazimova Society.